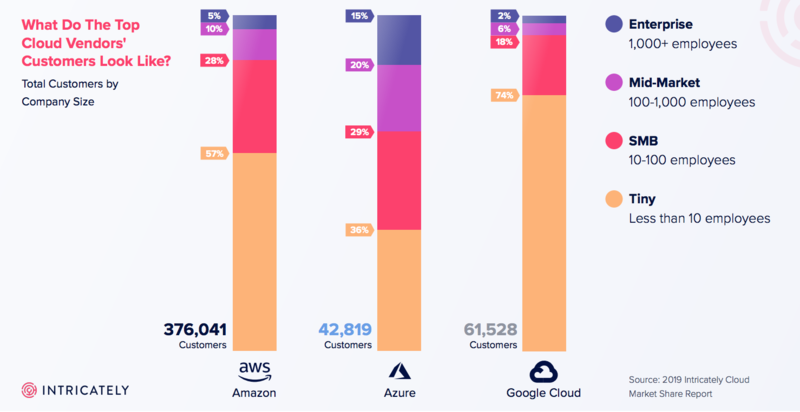 We recently launched our 2019 Cloud Market Share Report which provides an inside view into how over 7 million companies are adopting, using, and spending on their cloud hosting platforms including AWS, Google Cloud, Alibabe Cloud, and Microsoft Azure. These results came after spending months analyzing how over 7 million companies are adopting, using, and spending on cloud hosting. The report, and this post, serve as a sampling of the quantitative data we provide using our global network of sensors and our expert analysis. Our global network of sensors can detect how many customers have deployed all of these technologies, which allows us to create reports like this. As many would have guessed, Amazon Web Services has, by far, the largest number of total customers. Digital Ocean, “a reliable, easy-to-use cloud computing platform of virtual servers (Droplets), object storage (Spaces), and more”, is a very affordable and easily adoptable product. That’s why we see a high product adoption but low spend. While AWS continues to dominate from MSB to enterprise, startups like Digital Ocean have proven there is a path to market share if you're just thinking about customer count and not so focused on the expand part of land and expand. Legacy providers like rackspace are succeeding in the multi-cloud or hybrid category by facilitating their customers move to the cloud on partner networks (like AWS). AWS dominates again in terms of their number of enterprise customers. 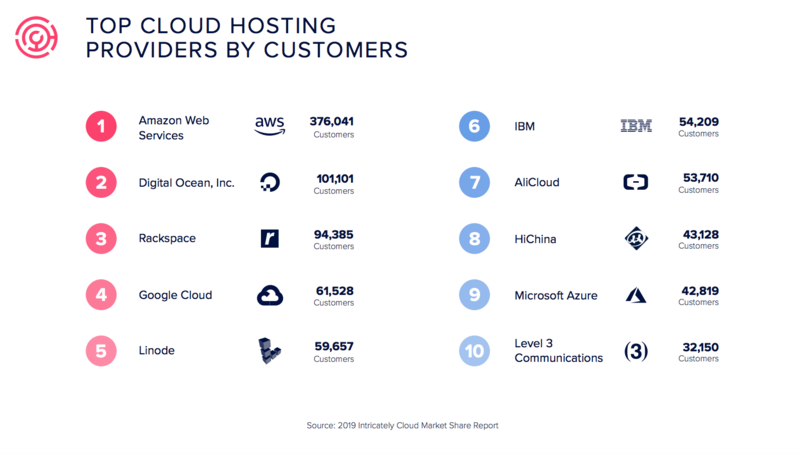 Alibaba Cloud comes in second place in terms of total number of enterprise customers. This is highly likely due to Asia’s rapid adoption of cloud infrastructure and Alibaba’s local success in the market with a similar mirroring Amazon. As enterprises adopt multi-cloud infrastructures, the disparity between Azure and Google Cloud could be based on their specific company-wide focuses like Google’s conversion of their G-Suite customers (SMBs) and Microsoft’s conversion of Office 365 and Outlook customers (enterprises). When it comes to cloud hosting, everyone names the big three: Amazon Web Services, Microsoft Azure, and Google Cloud. But what types of companies are using each? Again, we see that AWS in terms of total number of customers at 376,041 with over half of those companies having less than ten employees. This makes sense as AWS has worked hand-in-hand with startups and accelerators to ensure they get off the ground by providing free credits and a ton of documentation. 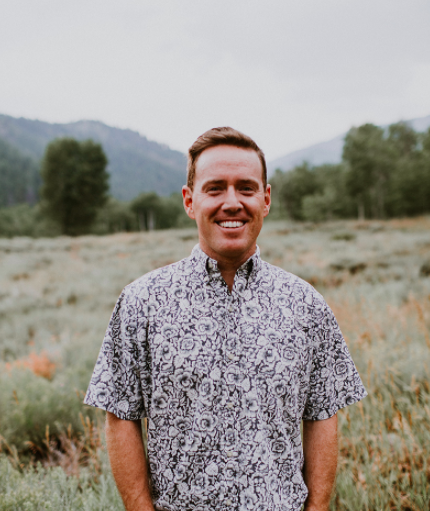 Microsoft’s Azure has a large number of enterprise clients, which makes sense when you reflect on their go-to-market strategy -- which largely involved shifting existing Microsoft enterprise customers to their cloud products. Microsoft Office 365 is one of the most widely adopted products and is a major funnel Microsoft leverages to upsell Azure products. These are just a few of the highlights of our most recent report. 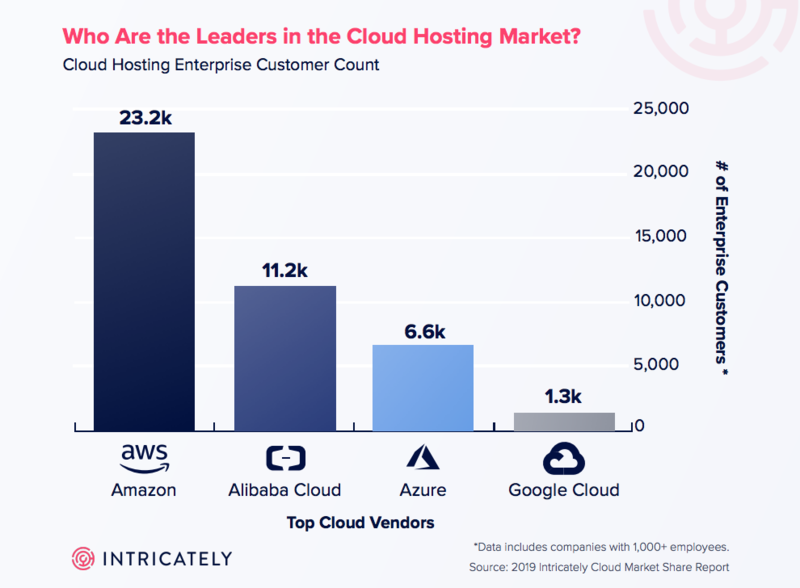 You can download the entire report to learn more about cloud hosting user and provider global distribution, YoY growth of the top cloud hosting providers, total number of cloud products deployed by company size, and much, much more.